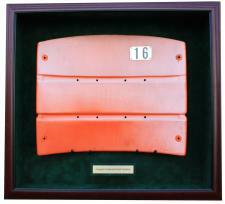 Any Stadium Seatback Display Case | Sports Memorabilia! This high quality Stadium Seatback Display Case can work for any seatback with a width of up to 21" and a height up to 18". 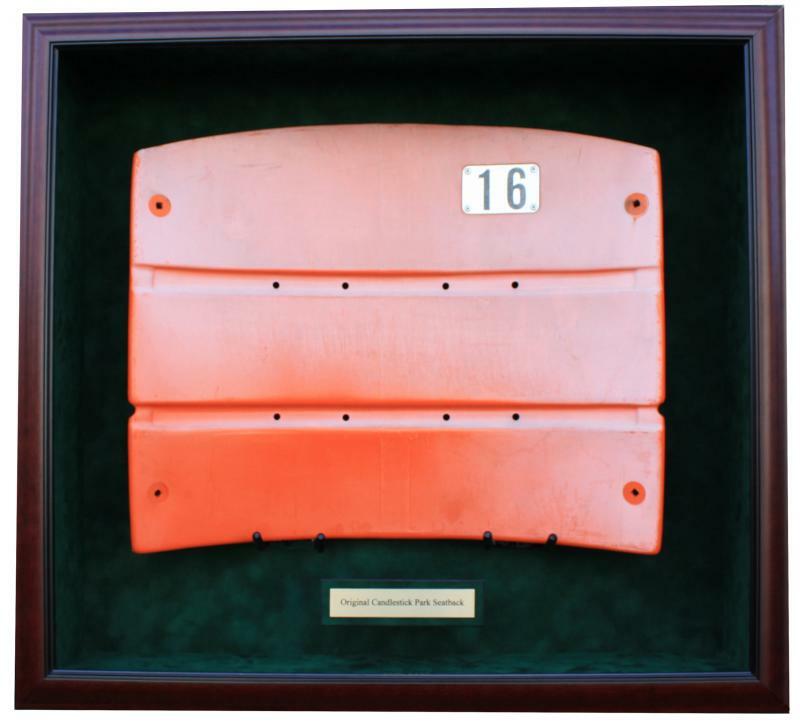 The one pictured has been created for the seatbacks from Candlestick Park but this stadium seatback display case can be used for most any seatback from any stadium and we can customize the nameplate for you! The display is constructed of solid wood with a Mahogany finish, an elegant green suede mat and a glass front. However other options are available. (Please visit this link Solid Wood Finish and Mat Color Choices to see your options for wood finishes and mat colors.) Each has museum quality 99% UV protection glass to help prevent fading of the autograph (s). Each display includes a lock and key feature to open the display from the front allowing access to the seatback so that the seatback can be easily removed at any time. Your nameplate can have 1, 2 or 3 lines. Please write in the comment section of your order what you would like your nameplate to say or feel free to call us during our business hours to order over the phone (877) 466-6826, M-F 10am-5:30pm Pacific. Each seatback display case ships separately in its own box with extensive packing materials to protect the glass and display case during transit. Please allow 2 weeks for delivery. 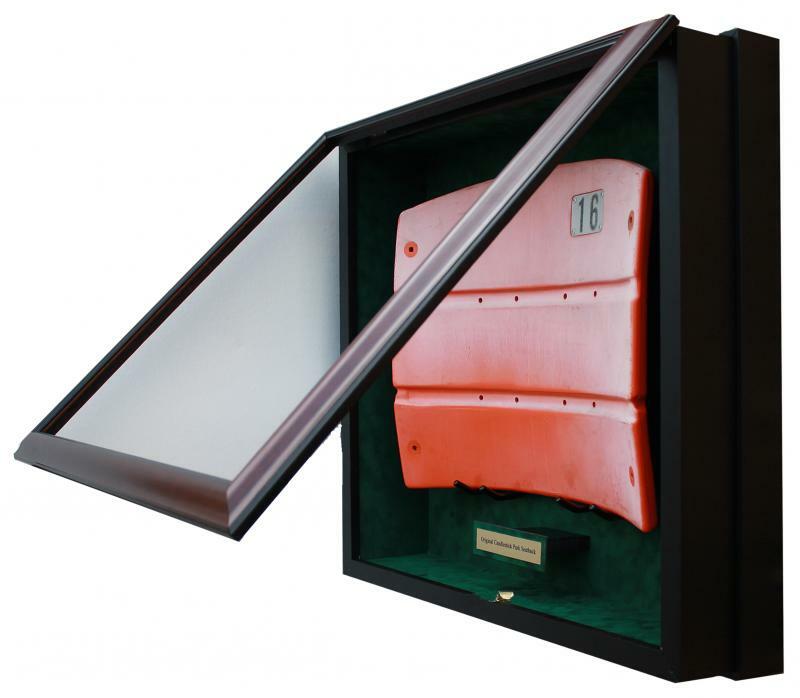 This "Any Stadium Seatback Display Case" is considered a custom made order so therefore all sales are final and not available for exchanges or refunds. If needed, another sized seatback display case is also available handling seatbacks with a width up to 16" and a height up to 21". This model is called our Verticle Large Model. Please phone us to order this model at (877) 466-6826.